Wake Forest University is a highly competitive school and its admissions statistics make Wake Forest University one of the 50 most competitive schools for undergraduate admissions globally. 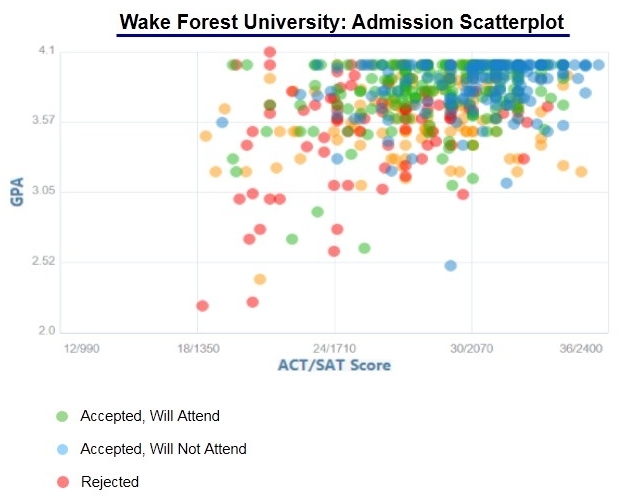 Similar to the trends across all top schools, Wake Forest University acceptance rates have continued to decline over the past 8 years and will almost certainly continue to do so into the future. The Class of 2021 was the single most challenging years to be admitted to Wake Forest University ever. 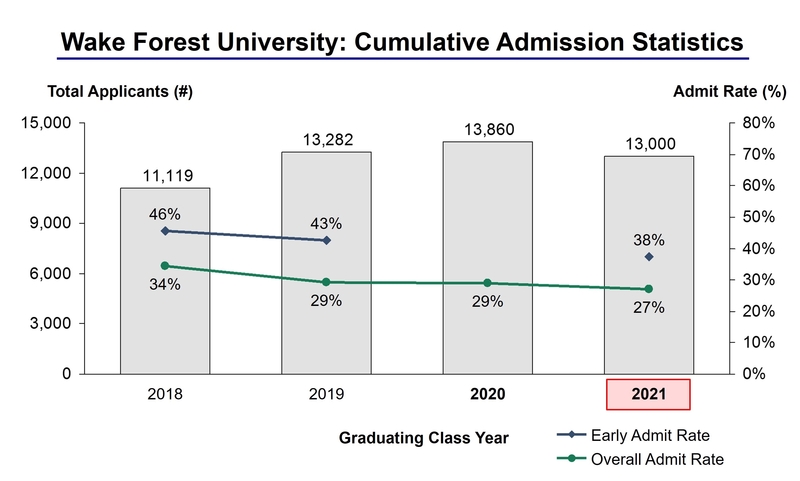 For the Class of 2021, 13,000 students applied to Wake Forest University of which 3,500 students were accepted, yielding an overall acceptance rate of 26.9%. Overall applications decreased by 6.2% over last year (2020 to 2021) from 13,860 to 13,000. For the Class of 2021, 750 students were admitted through the early admissions process. Total early applications totaled 2,000, yielding an early acceptance rate of 37.5%. Founded in 1834, not far from the Blue Ridge Mountains in Winston-Salem, North Carolina, Wake Forest University is a private research university that incorporates the kind of charismatic personal attention often found at liberal arts colleges but offers both undergraduate programs leading to the Bachelor of Arts and Bachelor of Science degrees. Wake Forest has made one of its on-going goals to educate global leaders with innovative training in the form of liberal arts. The university’s School of Business is considered one which develops “relevant business skills and helps students to find their passion”. Some of the most recognized Wake Forest alumni who have made an immense impact in the field of business include Charlie Ergen, co-founder and CEO of Dish Network; Zach Klein, co-founder of Vimeo; D. Wayne Calloway, Former CEO of PepsiCo ; Jabez A. Bostwick, American businessman and founding partner of Standard Oil, and a number of others. The total enrollment at Wake Forest University is 7,591, with 1,288 of that being freshmen. Total undergraduate enrollment is 4,812 and the remaining enrollment of 2,779 makes up the graduate and professional school numbers. Wake Forest has forty undergraduate and graduate departments that cover a variety of majors and minors. The university also has interdisciplinary programs, service-learning programs, co-curricular programs, and research opportunities. Wake Forest University competes in eighteen Division I sports in the Atlantic Coast Conference (ACC) and offers intramural sports and outdoor trips such as kayaking on the New River, hang-gliding and sky-diving. The university has over 150 chartered student organizations in a number of categories such as Civic Engagement, Cultural & Multicultural, Fraternities, Philanthropy and Fundraising, Professional and more.